They make it easier for caregivers, too. A new app called CancerAid helps patients and caregivers gather information to better tailor treatment options. There are so many health apps out there now that tell us what to eat, when to eat, how far to run and how to keep track of those calories. And the good news is they seem to be working, with research from the University of Washington suggesting that people are much more likely to adopt healthy behaviours when guided by the internet or an app. That's great for those of us who just need a little extra motivation to get off the couch, but the health tech sector is also creating apps to assist those who are already battling an illness or have a medical, physical or mental health condition that requires constant monitoring. There are programs to keep track of moods and menstruation cycles right through to helping those with chronic illnesses tailor their treatment and manage possible side effects. 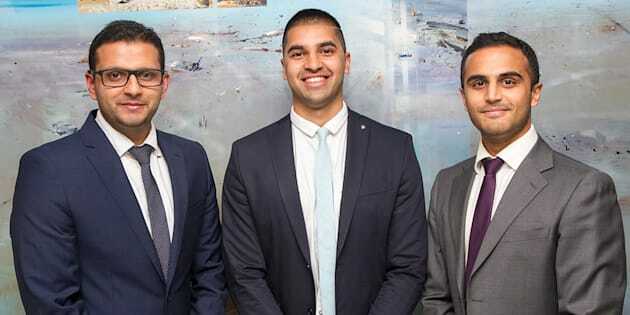 Sydney doctors Raghav Murali-Ganesh, Nikhil Pooviah and Rahul Gokarn developed the CancerAid app. 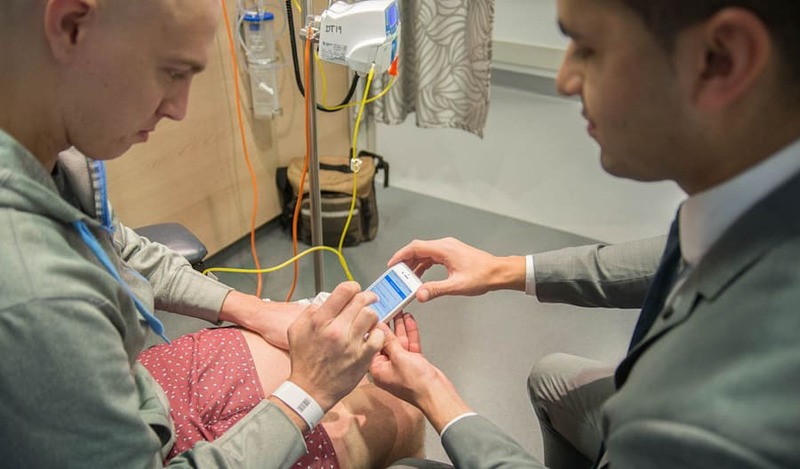 One of the latest to roll off the development line is CancerAid -- an Aussie-developed app that helps cancer patients to map and record how they feel at any point before, during or after treatment, giving their doctors additional information in order to better tailor treatment plans. The brains behind the free app -- Sydney doctor Dr Nikhil Pooviah of the Chris O'Brien Lifehouse cancer hospital and co-founders Dr Raghav Murali-Ganesh, Dr Akshat Saxena, Dr Martin Seneviratne and Dr Rahul Gokarn -- say they developed the app to encourage patients to take a more active role in their own care and treatment. Pooviah, who worked in oncology but now works on CancerAid full time, said the app really started to make ground last December when it was selected as part of not-for-profit health fund HCF's Catalyst accelerator; a six-month program designed to turn a health tech business idea into a viable enterprise. The program can also assist established health tech businesses scale up. Pooviah shows Chris O'Brien Lifehouse patient Brendan Kennedy how the CancerAid app works. Pooviah said dealing first-hand with patients and their caregivers revealed a gap in the market for a product such as CancerAid. "Working on the app isn't clinical medicine, but it's certainly a different kind of medicine," he said. "Instead of helping one patient sitting across the table from me, I have the opportunity to help millions. It's one of the reasons why each of us on the team became doctors in the first place, to help as many patients as we can." The app also has a feature called Telemedicine that allows specialists to monitor progress and offer on-call cancer support at any time of the day. MoodPrism: This app was developed by Monash University to track users' moods over time and support their mental health and wellbeing. It delivers feedback to users about their own positive and negative mental health, and offers useful information and links to appropriate online mental health resources such as beyondblue and Headspace. Available for iPhone and Android. Period Tracker: This app calculates the average length of your last three cycles so it can more accurately predict the date of your next one. It's also useful for women with polycystic ovarian syndrome and chart fertility signs. Available for iPhone and Android. MedAdvisor also allows people to play a greater role in their own health care. 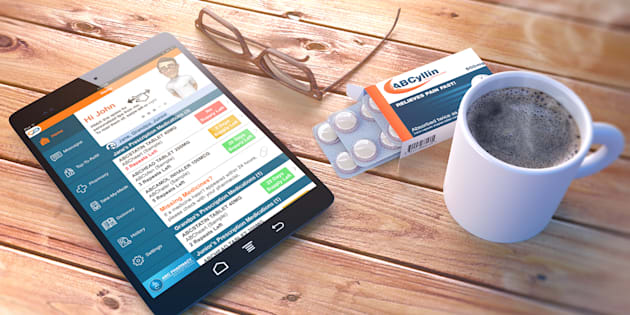 MedAdvisor: This Aussie-made app helps patients to keep track of multiple medications and has a handy alert function when medications need to be taken or re-stocked. Available for iPhone and Android. mySugr Diabetes Diary: This app helps those living with diabetes keep track of their carb intake, glucose numbers, blood pressure, weight and exercise. You can track these for a specified period of time and download a report for your GP. Available on iPhone and Android. 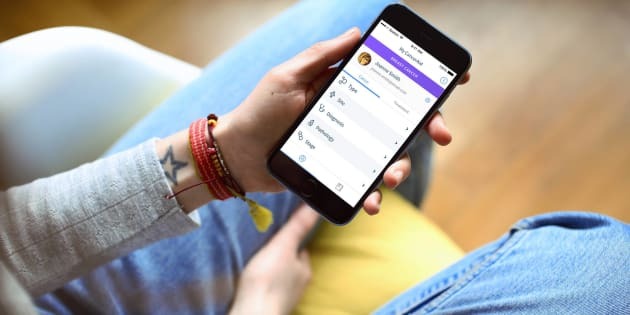 CancerAid allows patients to take control of their medical records, manage symptoms, keep a journal of their events and connect with others who are battling their own illness. Sydney artist Leila Simpkins, who was diagnosed in September 2015 with a neuroendocrine tumour, said being able to connect helped ease feelings of isolation and confusion. "The CancerAid app can offer a supportive community where you can ask questions and discover other stories, so it would really help," the 28-year-old said. "You can often feel confused and alone when you're dealing with a chronic illness so relevant communication, for patients and their carers is critical. It's true when they say that unless you've gone through this yourself, you cannot understand what it means to be diagnosed with cancer. "It is life transforming and it's hard to talk about it to other people." The first version of the app was released for beta testing in August, with an updated version due for release in October. Some of the functions of the CancerAid app.